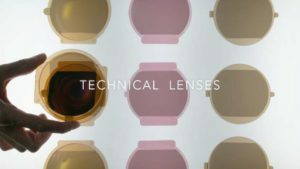 Safilo Group, the fully integrated Italian Eyewear creator, manufacturer and worldwide distributor of quality and trust, is the global leader in the creation and development of unique lenses. Safilo has a long-term stronghold in lens manufacturing and, with the recent acquisition of Lenti, the sun lenses manufacturer based in Bergamo, fully benefits from the most advanced manufacturing capabilities and processes for the development and production of “Made in Italy” state-of-the-art lenses, currently setting the trend for the most sought after brands around the world. 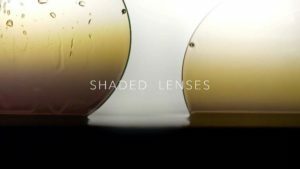 Sun lenses are the new frontier Beyond The Frame: they are an integral part and compelling differentiator for Safilo’s most precious eyewear designs. 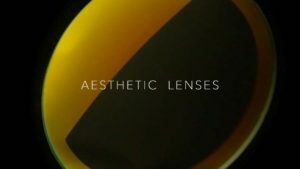 The company’s continuous commitment to sun lens innovation, research and development has led to the creation of exclusively aesthetic lens designs combined with unique craftsmanship capabilities. Creativity, expertise and experience lead to the creation of unique cutting-edge, high design and decorative lenses, which are true works of art thanks to their extraordinary graphics, exclusive colours, and spectacular mirror effects. 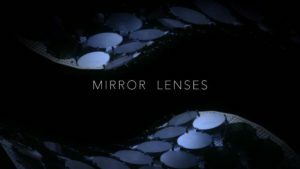 The mirroring treatment consists in a very thin, almost transparent metal layer which coats the lens’ surface, applied using a high-vacuum technique known as PVD, Physical Vapour Deposition. Mirroring can achieve either one or multiple colours thanks to the advanced multi-layer coating process which consists in depositing a sequence from 2 up to as many as 8 layers, allowing extraordinary multi-coloured and iridescent effects to be obtained. From the graphic lenses of outstanding designs, to three- dimensional lenses featuring prismatic or tactile effects, to flash mirrored lenses, to three-colour or bi-colour shaded lenses exclusive to specific collections: the offer is wide and includes a variety of multiple colour options. 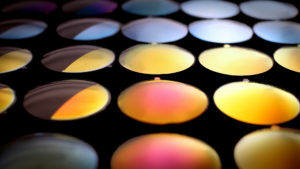 Shaded lenses colourization is obtained either by mixing dyes with the base material or by dipping the lenses in a coloured solution several times to vary the intensity of the desired colour. Safilo’s exceptional craftsmanship is also celebrated by lenses which feature exquisite minute embellishments, such as studs, metal stars and crystals insertions, enhancing the premium design of the most exclusive sunglasses. These insertions are applied by hand one by one, no matter the size of the embellishment. Safilo’s continuous research to achieve perfect vision has led to the development of technical lenses with the highest degree of sunray protection, offering an extraordinary instant experience for an enhanced colour perception and the highest protection. Polarized Lenses allow wearers to enjoy bright colours with no glare and distortion-free vision, providing unique benefits: glare-free vision, clear contrasts, natural colours, reduced eye fatigue and100% UV protection. Polaroid, the inventor of polarization technology, features different versions of polarized lenses, developed thanks to different technologies: Thermofusion™ Technology, produced exclusively for Polaroid, or Injected, either in Made in Italy superior quality polarized nylon lenses, or with polycarbonate lenses. Red HD Lenses, currently available on Carrera sunglasses, upgrade the polarization benefits: their particular colour boasts a high-contrast and anti-reflection treatment, which allows colours to be seen in a much more vivid way thanks to a careful study on the spectrum curve. This particular colour filters the blue light to convey eye relaxation and ultimately prevent eye aging. Chromapop Lenses, currently featured on Smith sunglasses, filter light at two specific wavelengths to eliminate colour confusion to the brain while providing a sharper, easier and faster visual experience. The result is an upgraded vision solution that offers instant advantage and higher confidence especially for sport performance. About Safilo Group Safilo Group is the fully integrated Italian eyewear creator and worldwide distributor of quality and trust, leader in the premium sector for sunglasses, optical frames and sports eyewear. Design inspired and brand driven, Safilo translates extraordinary design into excellent products created thanks to superior craftsmanship expertise dating back to 1878. With an extensive wholly owned global distribution network in 39 countries – in North and Latin America, Europe, Middle East and Africa, and Asia Pacific and China – Safilo is committed to quality distribution of its products all around the world. Safilo’s portfolio encompasses Carrera, Polaroid, Smith, Safilo, Oxydo, Dior, Dior Homme, Fendi, Banana Republic, Bobbi Brown, BOSS, BOSS Orange, Céline, Elie Saab, Fossil, Givenchy, Jack Spade, Jimmy Choo, Juicy Couture, kate spade new york, Liz Claiborne, Marc Jacobs, Max Mara, Max&Co., Pierre Cardin, Saks Fifth Avenue, Swatch, and Tommy Hilfiger. Listed on the Italian Stock Exchange (ISIN code IT0004604762, Bloomberg SFL.IM, Reuters SFLG.MI), in 2016 Safilo recorded net sales for Euro 1,252 million (preliminary data).